According to Jim is a 30 minute comedy series on ABC about a man who is a no nonsense successful businessman at work but struggles to deal with the more flexible relationships he finds at home with his wife and children. The love they share for each other ultimately overcomes the challenges that we all face in our family lives. 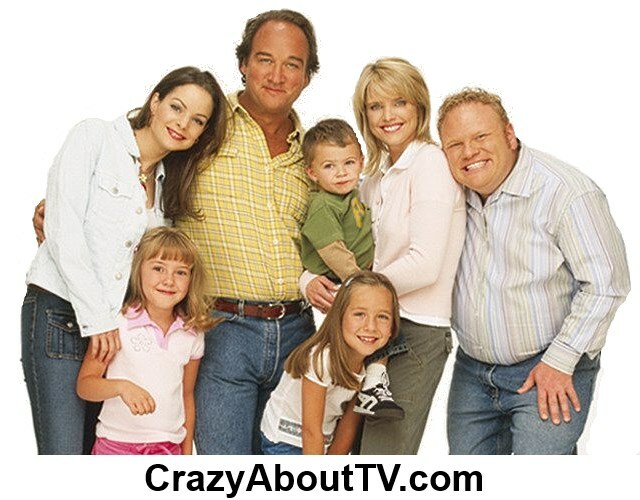 The original name for the series was supposed to be "The Dad" but it was changed to "According To Jim" before the first episode aired. Before starring on According To Jim, Courtney Thorne-Smith also had starring roles as Allison Parker" on "Melrose Place" and as Georgia Thomas on "Ally McBeal". While most of the guest stars' characters on According to Jim are introduced with a first and last name, the regular cast's characters last names have never been mentioned! Update: - On episode #105, the season finale for season four titled, "Wedding Bell Blues", Dana got married to a fellow named Doctor Ryan Gibson and she took her husband's surname and became Dana Gibson. It was also disclosed that Jim's middle name is Orenthal and Cheryl's middle name is Mabel. In 2004 James Belushi lodged a $4,000,000 lawsuit against his neighbor Julie Newmar ("Batman" and "My Living Doll") for defamation and harassment. Another neighbor told a reporter, "She's weird and he's a bully". They settled out of court in 2006 and Julie even appeared on a the 5th season episode of According to Jim titled, "The Grumpy Guy" where Newmar portrayed a neighbor who irritated Jim. The band that Jim plays with on According To Jim is a real-life band named, "The Sacred Hearts". Jim often performs with them as lead singer. They actually perform off the series as a professional act! In addition to his role on According To Jim as Andy, Larry Joe Campbell also had a starring role on the short-lived series, "The Trouble With Normal". James Belushi is of Albanian descent. His father came to the U.S. in 1934 from Albania and his mother was born in the U.S. to Albanian immigrant parents. Jim and Cheryl's home address is 412 Maple Street; Chicago, Illinois. In one episode, Jim complained about his Dvd player breaking while he was watching the movie, "Red Heat (1988)". James Belushi starred in that film. Thank you for visiting our ccording to Jim TV Show Cast and Episodes page!